Tsechen Kunchab Ling Library provides a quiet, conducive place to read and study about Buddhism in English, Tibetan, and Chinese languages. It is also dedicated to helping fulfill His Holiness the Dalai Lama and His Holiness the Sakya Trizin’s goal of preserving the Tibetan language. The library is staffed by a full-time librarian and offers a variety of activities and events. The Tsechen Kunchab Ling library contains hundreds of interesting books in English and Tibetan as well as some books in Chinese. It specializes in works of Buddhist philosophy, meditation, art, history, and biography and well as Himalayan adventure, travel, and photos. The library includes both a reference collection (books to be read on site) and a circulating collection (which may be borrowed). Check with the librarian at library@sakyatemple.org about specific books. Click here to browse our collections. 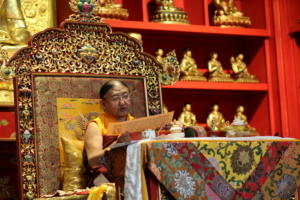 Tsechen Kunchab Ling holds periodic sutra readings on full and new moon days and other auspicious time. 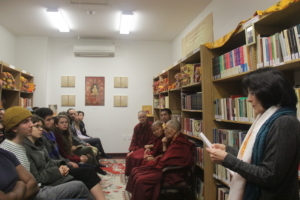 Tsechen Kunchab Ling Library hosts free lectures on topics relating to Buddhism, Tibet, and the Himalayas. Inspiring stories of great female Tibetan Buddhists who attained high realization during the early years of Buddhism’s arrival in Tibet. Based on a recent translation of the biographies of the most famous disciples of Drokmi Lotsawa and Sachen Kunga Nyingpo. Lecture by Dr. Chodrung-ma Kunga Chodron. American writers including Thoreau, Gary Snyder, Alice Walker, and others have all engaged in various way with Buddhism or Buddhist ideas. 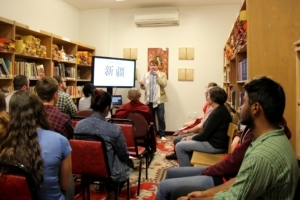 This talk looked at the development of Buddhism in America through the lens of their work. Lecture by Kyle Garton – Gundling, Ph.D. whose fascinating recent dissertation focused on how Buddhism is represented in American fiction. In the mysterious western deserts of China, along with the ancient Silk Road, the Uyghur people dwell in remote oasis towns.Using sticks, cloth, and animal skeletons, Uyghurs construct fantastic shrines in the desert sands. What are they for? Where did the Uyghurs come from? Find answers to these questions and more from Uyghur expert, Michael Evans, Doctoral candidate in the Department of East Asian Languages and Cultures at Indiana University. On October 30, 2016, through the kindness of Professors Robert M. Garvin and Juliette Guttman, the Tsechen Kunchab Ling Library added over 800 books to its permanent collection in the fields of Buddhist studies, Asian religions, and Western philosophy. The books were a gift from the estate of Professor Robert M. Garvin, who was a professor in the Philosophy Department at the State University of New York at Albany for 37 years. The collection represents the treasured books from his personal library. Venerable Khenpo Kalsang Gyaltsen presided over the accession ceremony, which was attended by 20 students from Vassar College. Professor Juliette Guttman was the guest speaker, who shared inspiring anecdotes from Professor Garvin’s life, teaching, and mentorship of students. All present shared interesting things they had learned from reading the books in the collection. At the conclusion of the ceremony, everyone present opened books from the collection and read aloud simultaneously, bringing the books again to life, in grateful memory of Professor Garvin. Venerable Khenpo Kalsang Gyaltsen was one of the first translators to participate in the project, assisted by Chodrung-ma Kunga Chodron and under his leadership, Tsechen Kunchab Ling hosted one of the early 84000 working group meetings. During the sutra reading event on April 3, His Holiness Sakya Trizin described the importance of the 84000 project, and project representatives described recent exciting progress. Click here to watch ” The importance of the 84000 project” led by His Holiness the 41st Sakya Trizin. 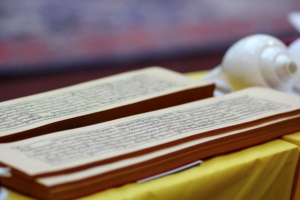 Following this, His Holiness and everyone in attendance read from the sutras recently translated by the project, including a number translated by the Sakya Pandita Translation Group.